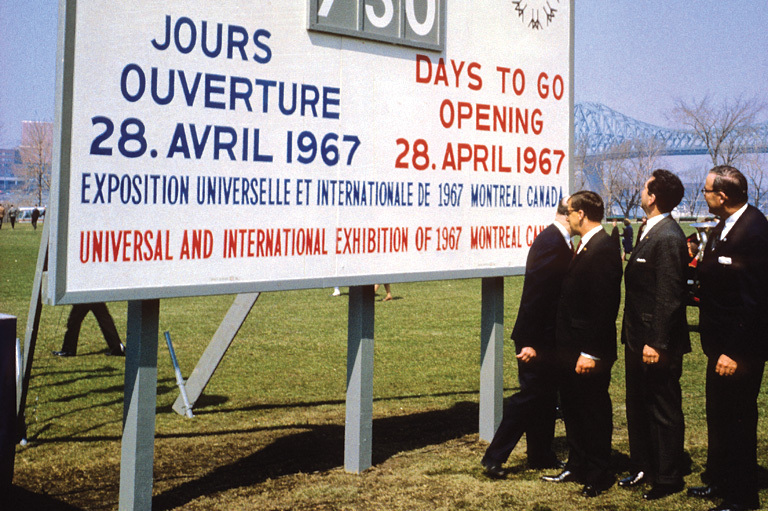 Expo 67 officials gather in 1965 for an official countdown ceremony marking the number of days until opening day. Apart from the 1851 Great Exhibition in London and the 1889 Exposition Universelle in Paris, few world’s fairs have resonated as much within their host countries and around the world as Montreal’s Expo 67. The fair in Canada’s centennial year attracted more than fifty million visitors, an incredible turnout for a country that at the time had a population of only twenty million. It brought together a record-setting sixty-two nations. Expo 67 marked an era with its avant-garde, humanist ambitions, redefining the word Canada. “World’s fairs are about the future, and the great exposition which took place on the man-made islands in the St. Lawerence River in the summer of 1967 was about the future of Canada as well as the future of science, architecture, education, and cinematography,” journalist Robert Fulford wrote in 1968, reflecting on the several months he lived at the Expo 67 site while covering the fair for the Toronto Star. But Expo 67 was actually something of a miracle. Its organizers had only four and a half years to prepare — rather than the intended seven. The responsibility for that lies with Moscow, the host city designated for the 1967 world’s fair by the Bureau international des expositions (BIE) in May 1960 — in anticipation of the fiftieth anniversary of the Russian Revolution. (The Canadian bid was defeated in the fifth round by a sixteen-to-fourteen vote.) But, two years later, the Soviet Union backed out, officially because of the cost — unofficially out of fear of capitalist propaganda. Montreal Mayor Jean Drapeau convinced Prime Minister John Diefenbaker to take the project on, coinciding with the Canadian centennial. On November 13, 1962, the BIE voted unanimously in favour of the Canadian bid. The 1967 world’s fair would open its doors in Montreal on April 28, 1967 — four years, five months, and fifteen days later. The organizing committee soon came up against the problem of a site. Where would they find five square kilometres near downtown and primary approach roads? 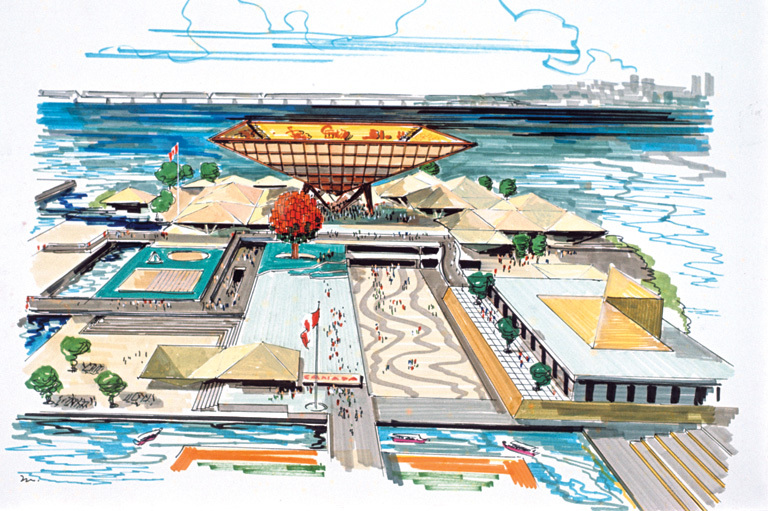 While the organizing committee considered a half dozen options, Drapeau upset the apple cart with an ambitious announcement: Expo 67 would be held in the middle of the river — on an island that didn’t even exist yet. His plan was to fill in a series of small islands and shoals to expand Saint Helen’s Island and to build a two-square-kilometre island from the water up: the future Notre Dame Island. 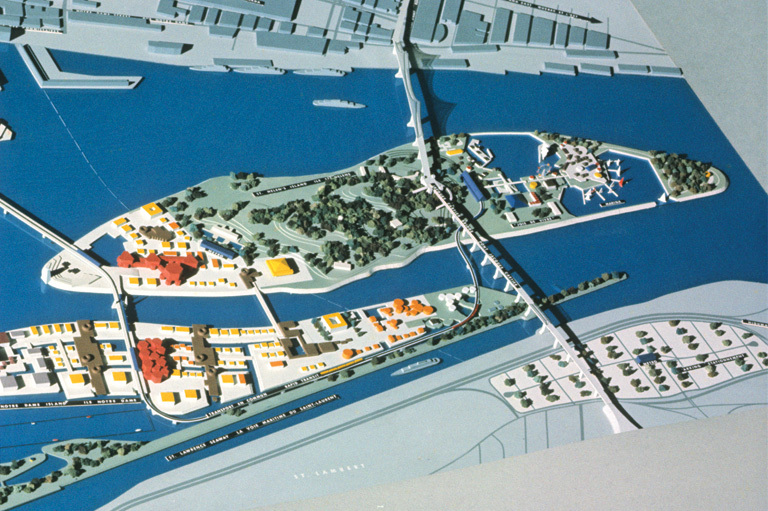 A scale model of the proposed Expo 67 site. The idea wasn’t all that far-fetched: It would prevent real estate speculation while giving Expo the most beautiful site anyone could hope for. But it added a Herculean task to an already breakneck schedule; it would take eleven months and countless trips by truck to pile up the twenty-eight million tonnes of stone and earth required. Against the advice of the organizers, Drapeau persuaded Ottawa and Quebec City that his idea should carry the day. But once work started in August 1963, the two chairs of the organizing committee, Paul Bienvenu and Cecil Carsley, resigned. Even the computer at California’s prestigious Stanford Institute predicted that Expo could not possibly be ready before 1968, even 1969. The majority of the public and political leaders thought that it should be postponed or called off. Expo 67 wouldn’t be getting off the ground. “I would be less than frank if I did not add that I feel we all have cause for concern over the magnitude of the tasks that must be accomplished if the fair is to be the success it must be,” Prime Minister Lester Pearson said on August 13, 1963, at the inauguration ceremony kicking off construction of the fair site. Expo 67 was salvaged by its two new leaders, appointed at the beginning of September. The new commissioner general, the ambassador Pierre Dupuy, had worked for a number of years at the BIE, making him one of the leading specialists in this type of event. The new deputy commissioner general, engineer Fletcher Shaw, headed up the largest engineering firm in Canada, making him the best person to run the show, including construction. 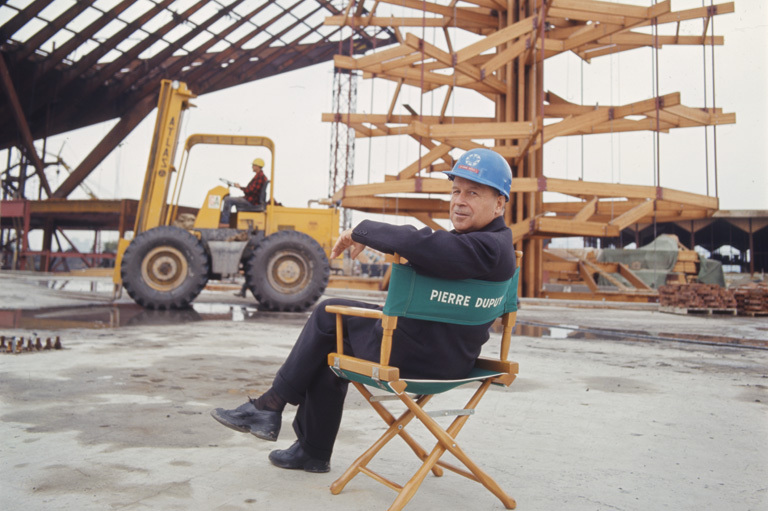 Pierre Dupuy, the commissioner general of Expo 67, oversees construction of the Canadian pavilion in 1966. This pair rejuvenated the Expo 67 team, breathing optimism into the project, as journalist Raymond Grenier described in a 1965 book that predated the fair, Inside Expo 67. Dupuy and Shaw exuded confidence, telling all who would listen that choosing to go with the islands was the best decision that could have been made in terms of engineering, aesthetics, and selling the event. Expo 67, they vowed, would happen in 1967! They put together an organizing committee made up of six francophones and four anglophones. Its composition was in and of itself a new approach because the members were all bilingual and on equal footing. According Diana Thébault Nicholson, who worked on protocol and operations and was a spokesperson, at the time it was more common to see francophones reporting to anglophones. “Their equality was the most remarkable thing,” she said. Workers assemble the German pavillion, August 1966. The committee wound up with an unusual nickname: “Les Durs,” or the tough guys, for their relentless drive to make Expo happen and to impose their will, even on the government. In December 1963, Pearson was astonished to learn that the budget had grown from $40 million to $167 million; it was still approved, but by just one vote. The vocal opposition attacked the choice of logo, the official song, the hostesses’ uniforms, but to no avail: The tough guys did whatever they wanted. And, even though the social climate of the day was one of labour protests, they managed to achieve union peace during the construction. In July 1964, the city of Montreal officially handed over the islands to the organizing committee. Just two years and nine months remained — 1,015 days! — to complete the ambitious project. They had to build 847 pavilions and buildings, twenty-seven bridges, seventy-five kilometres of roads and sidewalks, forty kilometres of sewers, 150 kilometres of pipes, twenty-five thousand parking spots, 256 basins, and 6,150 streetlights. Everything rested on the shoulders of the director of installations, Colonel Edward Churchill, who would coordinate over six thousand workers. During the Second World War, the military man from Manitoba had helped the Allied advance by building 192 airports. A man of his times, Churchill borrowed an organizational technique from NASA: the critical path method. “This technique, which was brand new at the time, involved distributing work in such a way that 178 or 180 pavilions could be built at once,” the director of public relations, Yves Jasmin, recalls. With leading-edge computer monitoring, Churchill was able to order all the materials at once, build all the foundations and infrastructures simultaneously, and coordinate the construction of some one hundred buildings in a very specific order. By winter 1965, he had already started planting trees. 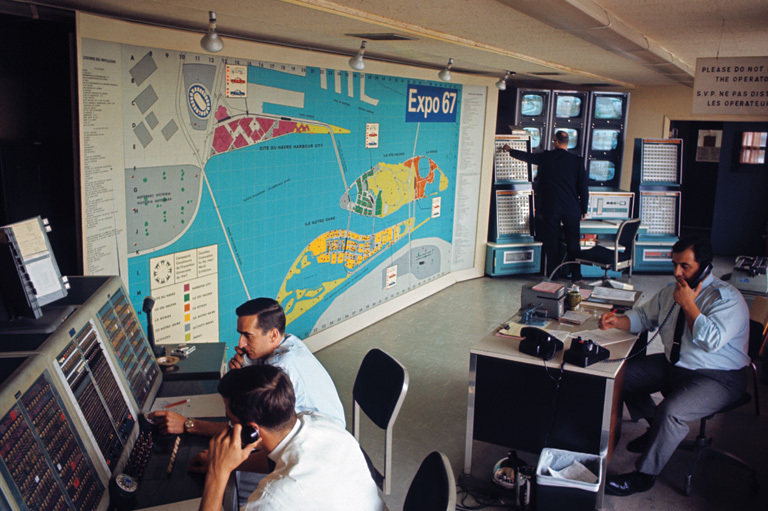 The Expo 67 control centre, considered state-of-the-art in 1967. By fall 1966, the pavilions were virtually all finished, and exhibitors started setting up, as Montreal launched its brand new metro and opened new highways. 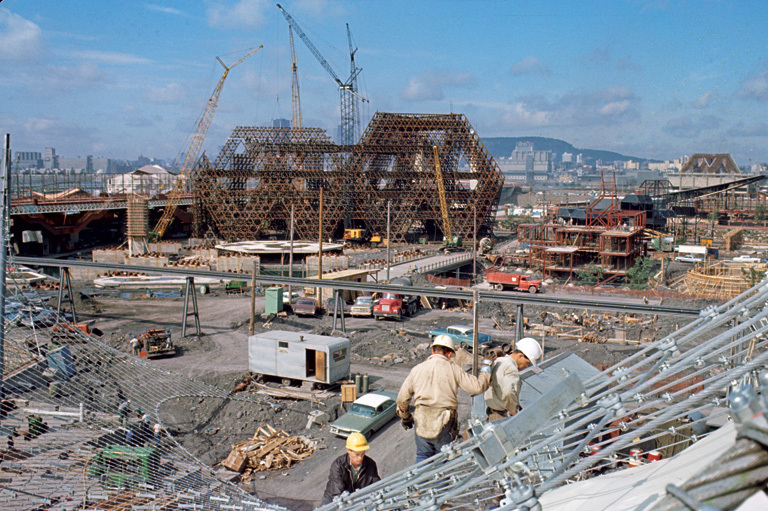 Expo 67 would be ready on time. But on the eve of the inauguration, an unusually cold April meant that the grass was still yellow. The head of the horticulture department, one Pierre Bourque (the future mayor of Montreal), had the grass dyed green; Expo 67 would be delivered on time, and it would be perfect! A conceptual sketch of the Canadian pavilion. To learn more about Expo 67 Mission Impossible, go to Expo-67.ca. Julie Barlow and Jean-Benoît Nadeau are the award-winning authors of four bestselling books, including Sixty Million Frenchmen Can't be Wrong and The Story of French. The couple's latest book is The Bonjour Effect: The Secret Codes of French Conversation Revealed. Barlow and Nadeau worked as researchers on the Productions de la Ruelle documentary, Expo 67 Mission Impossible. The couple is based in Montreal, where they live with their twin daughters. This article originally appeared in the June-July 2017 issue of Canada's History. Selling Montreal’s fair to the world was hard, but selling it to the Canadian public was harder. 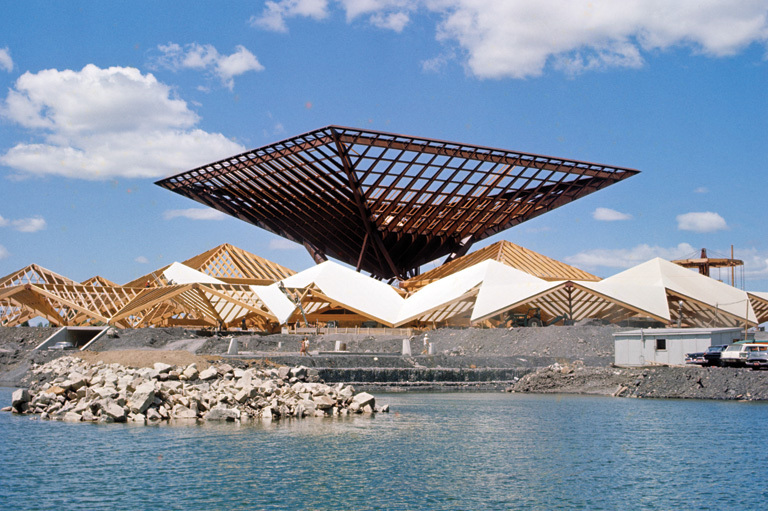 Expo 67 was so revolutionary, so fresh, that it was as if a whole new world had been created. Howie Morenz was ranked by The Hockey News as the 15th best player in hockey history. Yet, with all that accomplished during his life, he is still more commonly known for his untimely death.